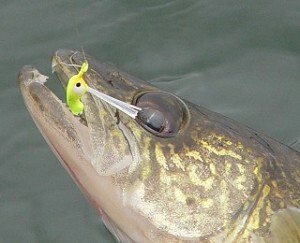 Many pro walleye anglers feel jigs are the most versatile and productive of all artificial lures. They will work for a wide variety of species in almost any type of conditions. Jigs, with the exception of floating jigs, are weighted by melting a metal substance into a liquid and pouring it in a mold which shapes the head and collar. Most jig heads are made of lead which gives the lure its weight. Another popular metal material for weighting jig heads is tungsten, which is heavier than lead and environmentally friendly. Jigs are a rather simple design and come in wide selection of shapes, colors and weights, each for a specific fishing presentation from the smallest at 1/100th oz for ice fishing up to 2oz for Stripers and Muskies. The most common weight sizes for inland freshwater fishing are 1/64, 1/32, 1/16, 1/8, 1/4, 3/8, 1/2, and 3/4 ounces. The most common hooks used on jigs are the strong wire O’Shaughnessy or light wire Aberdeen. A jig hook is bent on the shank before the eye about 60 to 90 degrees, the bend in the hook will determine the eye placement on the jig and how it rides through the water. The hook shank length has varying applications, short shank hooks are mainly used for live minnows, longer shank hooks are favored for rigging soft-plastic grubs, tubes, worm or lizard bodies. Hook wire diameter is also a consideration, light wire hooks are often used in fishing around brush piles and cribs as they will bend and pull free when snagged, they’re also a good choice when fishing for Panfish and crappies with soft mouths as the light wire will penetrate quickly upon the hook set. Strong wire hooks perform well in weedy and rocky areas for bass and northern pike when you need to horse a fish out from cover. Color of jig hooks includes bronze, black and gold, with the most recent popular color red marketed as blood or bleeding hooks. The jig collar is positioned directly behind the jig head. Barbed collars have a small hook to attach and hold soft plastic baits stopping them from sliding down the hook other collar designs include screw locks or wire holders to hold plastic baits. Straight collars are used to tie dressings or attach on the jig such as hair, feathers, tinsel, living rubber and silicone skirts. When choosing jig head colors one must consider the fishing conditions and type of water, clear, stained or dark. Jig heads are available in natural, fluorescent, metallic, two tone and glow finishes. In stocking your jig box start out with handful of basic colors: black, brown, white, yellow, pink and red for clear to stained water, with fluorescent chartreuse, green,orange and glow for dark water. Experiment and try various colors until you find the color choice for the day. The main consideration when selecting which jig to use is its weight. Your selection should be based on type of fish and water depth. When on the water the same steps should be taken with considering water current speed and wind velocity while fishing. Your jig must be heavy enough to reach the desired depth, but not so heavy that it sinks too rapidly. Fish prefer a slow drifting down bait than one that just plummets toward the bottom. As a general rule use 1/8 oz for every 10 feet of water. If you’re fishing in fast current such as rivers additional weight is required to reach the bottom. Wind also has the same affect as fast currents, by increasing the water resistance on the line and lure, which make it more difficult to reach the desired depth. Panfish and Crappies 1/32 – 1/16 – 1/8 oz. Walleyes and Bass 1/16 – 1/8 – 3/8 – 1/2 oz. Northern Pike and Muskies 3/4 – 1 – 1 1/2 oz. Lake Trout and Stripers 3/4 – 1 – 1 1/2 – 2 oz. Depending on their size dressed jigs can be used for most all species including: panfish, crappies, bass, stripers, northern pike, walleyes, and lake trout. The dressing material is tied to the jig collar to form a body they include: bucktail hair, marabou, mylar and tinsel which provides a mimicking life like action in the water of minnows and other aquatic life. Dressed jigs also holds fish scent well and can be tipped with live bait as an added attractant. Fishing with soft plastic jigs bodies gives the angler countless choices of options from colors, scents, shapes to types: grubs, reapers, worms, tubes, lizards, crawfish, leeches and minnow bodies. By far the most used when fishing a jig and plastic combination is the curly tail grub. This presentation will be successful for any freshwater game fish, straight retrieved or trolled the tail vibrations resembles a baitfish, when using a split tailed grub or tube hopped along the bottom with short snaps replicates a crawfish. Jigs tipped with reaper flat tail will imitate a leech swimming through the water. The subtle action of a paddle tail on minnow bodies mimics a baitfish when retrieved. Recently many new soft plastic baits have evolved by incorporating the jig head into the body of the bait, making the bait feel more natural when the fish strikes. With these new soft plastic baits life like patterns and holographic colors have been introduced to imitate the realistic look and flash of baitfish. Fishing with live bait jigged slowly at times of the year can be a deadly presentation especially when the water temperature is colder and the fishes metabolic rate reduces making them reluctant to chase faster moving lures. Rigging techniques for live bait are simple, always hook the bait, minnows, worms and leeches through the head or snout. Jigs designed for live bait have no collar hook required to hold soft plastic’s, they include: Round head, swimming, wobble, propeller, stand up floating and weedless. For using live minnows the preferred choice is a short shank round and floating head with the option of a stinger hook attachment for short striking fish. Other live bait jig options are spinner blades mounted underneath the head to produce added vibration and flash. As the name of this jig implies they float. Floating jigs come in two types hard bodied and soft bodied, both require using weights or a form of rigging such as: sliding sinker, bottom bouncer or simple split shot rig. Floating jigs are used for live bait and are a great choice when presenting the bait just off the bottom on lakes and rivers. Weedless jigs are an excellent choice when fishing live bait in cover, the guard prevents getting snagged on weeds and brush. The hook guard is made of trimable plastic bristles, wire or a plastic V shape and are anchored in the jig head facing upwards towards and covering the hook point allowing the jig to ride over and through underwater obstructions. Jigs can be a highly effective fishing presentation when the proper set-up (rod, reel, line and jig) is used. Unlike a spoon or inline spinner, when a fish strikes the lure and hooks itself, a jig bite most often is very light as the fish inhales the bait usually on the fall when the jig is settling towards the bottom. To detect strikes more easily jigs should be fished with stiff (fast action) sensitive rod with enough flex to cast your jig along with using the lightest possible line for the species and fishing conditions. This will help you feel the bite on the retrieve or when the jig is sinking by keeping the line taut. Many expert anglers use the fishing line as a strike indicator, when the jig sinks they watch the line for any subtle twitches signaling a strike or if the line stops indicating a fish is moving upward with the jig. To optimize the visual of fishing line jig fisherman prefer to use fluorescent colored line over clear monofilament and wear polarized sunglasses improving the line visibility even more.